Shaw Communications' naming rights for the venue have expired on December 31, 2018. As of January 1, 2019, we are known as the Edmonton Convention Centre. 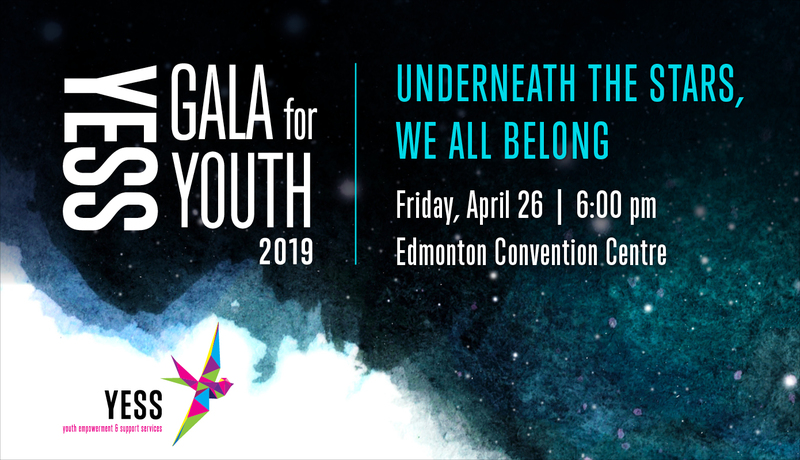 Join us on April 26 when YESS returns to the Edmonton Convention Centre in the heart of downtown for their YESS Gala for Youth 2019. Since the dawn of humanity we have looked to the night sky to make sense of our place in the universe. Joyful or hurt, comforted or lonely, we are all dreamers when we gaze up at the stars, seeing not the vast darkness but the light. Only together can we create a community of healing, hope, and love. Your evening under the stars will be filled with a unique show of artistic and musical performances, a gourmet feast, and cosmic wonder all in support of youth on their journeys towards healing. For more information on the event and guest speakers, please visit their website here. Time: Cocktail Reception 6 p.m. | Dinner 7 p.m. There will be no cover charge and $1 from every feature cocktail purchased and every feature menu item ordered will be donated to YESS! Our partners at the Fairmont Hotel Macdonald have created a promo code for YESS gala guests! After your evening Underneath the Stars, enjoy an overnight stay at the Fairmont Hotel Macdonald. Make your booking here. If you have any questions about the 2019 YESS Gala for Youth, please reach out to me at andrea.ferguson@yess.org or call 587-415-4169..
"Thank you to your team of chefs, servers, bar staff, cleaners and security. We had an epic event and many great comments about the food." We'd love to hear about your event. Fill out our Event Inquiries form and let's bring your vision to reality.